Rick Lund’s move to Skagit County offered wide-open spaces and good schools for the children. It also meant his previous half-hour commute now can stretch to two hours each way. He’s made the best of it. It was a life-altering decision that baffled my friends and co-workers alike, and still elicits incredulous looks more than 29 years later. 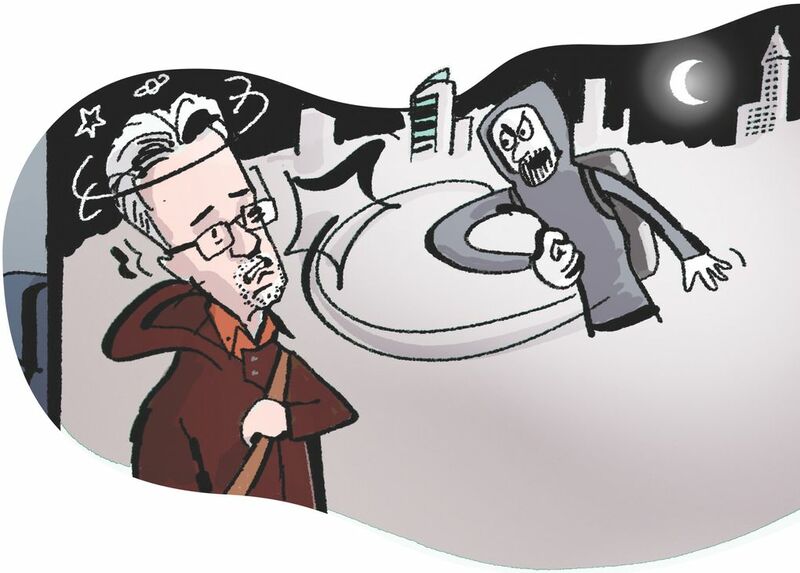 I was in my mid-30s and four years into my career at The Seattle Times when my wife and I uprooted our young family on the just-beginning-to-sprawl Pine Lake plateau near Issaquah to move to the country in south Skagit County. We had many reasons for the move. We were disillusioned with suburban living, and neither one of us wanted to raise our three girls in what we perceived back in 1989 as overcrowded schools and cookie-cutter homes on small lots. What drew us to the Skagit Valley, where I was born and raised, was wide-open spaces for our girls to roam and a sizable building lot overlooking Skagit Bay seven miles south of Mount Vernon in the well-regarded Conway School District. Our daughters also would be near their grandparents. The unreasonable and illogical side of the move was this: My one-way commute to Seattle would go from 21 miles and about 30 minutes in ideal traffic conditions, to 56 miles and more than an hour. Fast-forwarding three decades, as traffic has worsened, my average daily commute now is between an hour-and-a-half to two hours each way. 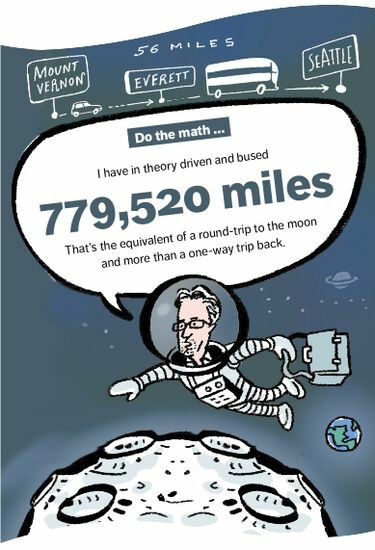 If you do the math, figuring five-day work weeks and four weeks of vacation per year, I have in theory driven and bused 779,520 miles between Tulip Country and the Emerald City. That’s the equivalent of a round-trip to the moon and more than a one-way trip back. I don’t mind my commute, but I must say I don’t love it to the moon and back. Oh, the commuting stories I can tell. The commute has ranged from fun to bizarre to downright dangerous. 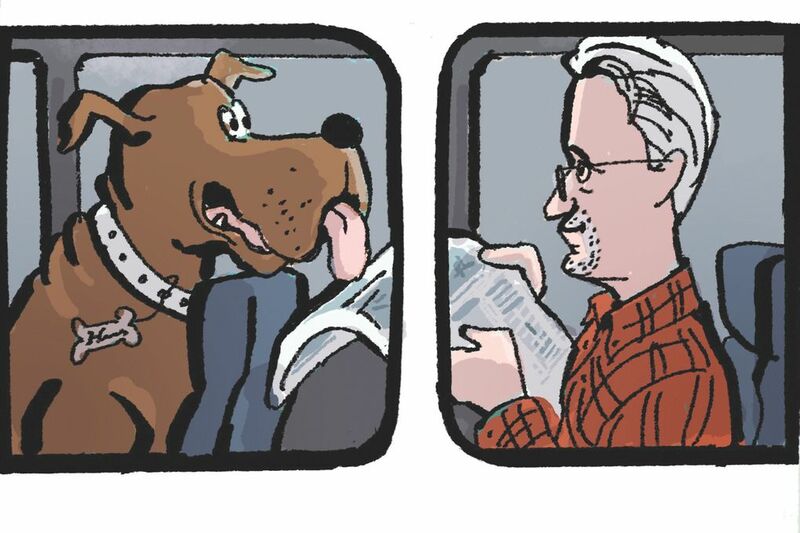 I’ve shared bus rides with birds, gerbils, cats and every breed of dog you can imagine, including a 135-pound Great Dane named Hemingway, a five-day-a-week passenger on Sound Transit’s 510. 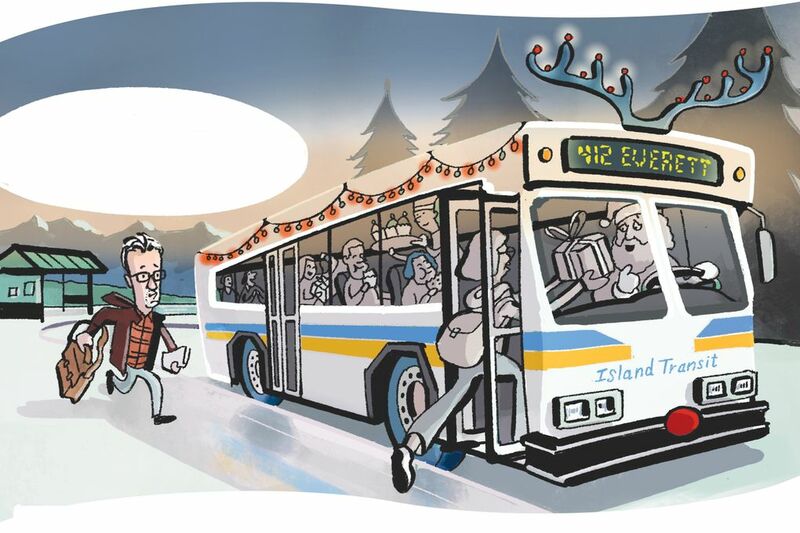 I once boarded a Christmas party on wheels, by pure happenstance on an Island Transit bus to Everett, with decorator lights strung from window to window, a gift exchange (I didn’t bring one) and lots of food (I was encouraged to partake, but had none to share). Late-night bus rides, however, have brought out the dark side of commuting. I now avoid them. I was punched in the face by a stranger one night while walking to my bus stop. On another occasion, my Sound Transit 512 bus from Seattle to Everett was pulled over on I-5 by several Seattle police cars so officers could search for a wanted criminal. Through it all, however, I am here to tell you I have survived long-distance commuting for all these years. More opportunities in recent years to work from home have helped. What’s really saved me, however, is I’ve looked for every excuse to avoid getting behind the wheel and driving to work. 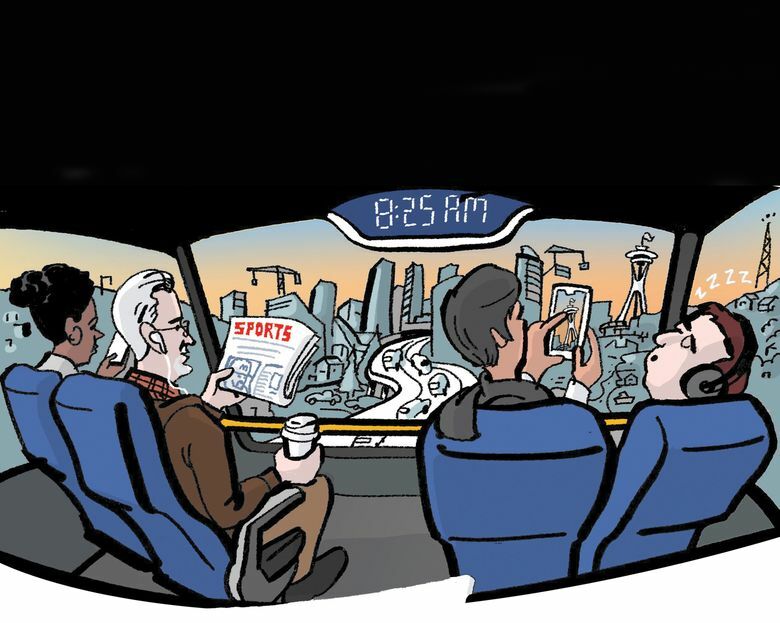 I have come to enjoy — and actually look forward to — sitting in the catbird’s seat of a “double tall” (two-deck) Sound Transit or Community Transit bus with my coffee and reading material. These days, I don’t view my bus commute as time lost or misspent. Rather, it’s life-giving. I read the printed Seattle Times, Time and Sports Illustrated magazines, and do my daily devotions — brain-boosting exercises I might not otherwise make time for at home. I wrote most of this story on my laptop on the bus. And for that, rolling along in the HOV lane past solo drivers in gridlock below me, I’ve come to realize I’ve developed a peculiar habit: I am addicted to public transportation. This malady has even seeped into my leisure time. When taking family vacations in other cities, I often forgo the convenience of renting a car for riding that city’s subway, bus or streetcar. This didn’t always go over well with my wife and daughters, who weren’t crazy about planning tourist activities around public-transit schedules. Perhaps the shame of living so far from work guilted me into this fixation on public transportation. But to be quite honest, I haven’t had good experiences driving to Seattle. I began long-distance commuting with lofty ideals. My car would become a rolling university. I would listen to books on tape, maybe even learn how to speak a foreign language. But I invariably squandered opportunities for learning by listening to sports talk radio and music, often in bumper-to-bumper traffic. The low point came one foggy Saturday night in November in the early 1990s. I had just finished my shift on the Times’ Sports desk, where I was the Sunday section editor. Somewhere between Marysville and Smokey Point I decided to grab the first edition of the paper on the passenger seat to check a fact in our Apple Cup coverage. A few minutes after turning on the dome light as I pulled the paper near my face (I know, a really stupid thing to do), a Snohomish County sheriff’s deputy pulled up alongside and motioned me to pull over. The officer issued me a ticket for negligent driving ­— a charge just one step below drunken driving. The officer would testify in court, “Mr. Lund appeared to be driving with his knees.” I told the judge my hands were firmly on the wheel while I was consulting the newspaper, as I would a map. I got off with a light fine and a scolding. I began looking for public transportation options, and there weren’t a lot back then. But there are now. The most common question I’ve been asked over the years about my commute — besides ARE YOU INSANE? — is “Where do you catch the bus?” Well, that depends on which transit agency I choose to travel. Community Transit: A 10-minute drive to the Stanwood/I-5 Park & Ride puts me on express bus 422. It’s the quickest and the most direct route, but the down side is there are only two runs per day each way, with the last southbound bus departing at 6:25 a.m., and the last northbound bus at 5:30 p.m.
Sound Transit: In recent years it’s been my go-to route, which means a 30-minute drive to Everett Station to hop aboard the commuter-oriented 510. The upside with this express bus, and its nonpeak partner the 512, is for most of the day it leaves every 15 minutes. The southbound 510 is an option until 8:45 a.m., and the last northbound doesn’t leave Seattle until 7 p.m. 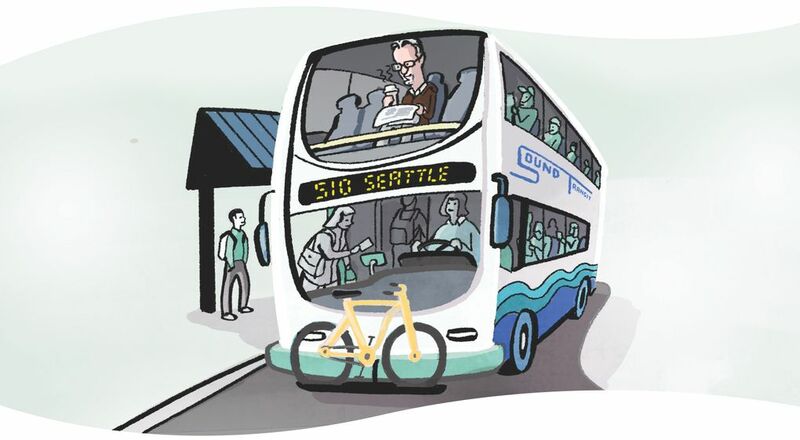 In ideal conditions, it’s a 35-minute ride aboard the 510 between Everett and Seattle. The 512, which makes several stops along the way, takes an hour. Skagit Transit: A 5-minute drive north to the south Mount Vernon Park & Ride puts me on the express Mount Vernon-to-Everett 90X at 7:30 a.m. It’s complicated by a transfer to the Sound Transit 510 in Everett, but it’s our preferred route when my wife and I are doing something in Seattle after work and we only want to take one car. Island Transit: This infrequent option (but boy was that Christmas party great!) leaves the Stanwood/I-5 Park & Ride as late as 7 a.m. The Camano Island-based bus, like Skagit Transit, only goes as far south as Everett. Sounder: The Sound Transit-operated train goes between Everett and Seattle. Though the views along Puget Sound are spectacular, the disadvantages are many: Limited runs, an hourlong ride that can be canceled in the winter due to mud slides, and a King Street Station destination well south of The Times’ offices in South Lake Union. Retirement is on the horizon. As I look toward the end of my commuting days, I can see the light at the end of the tunnel — and it is not the headlamp of an oncoming Sounder train. When that time comes, I think I might miss my daily reading time over coffee to work and back.